Archaeologists who have been exploring the world’s largest underwater cave, recently discovered in Mexico, presented their findings Monday, including fossils of giant sloths and an elaborate shrine to the Mayan god of commerce, reports phys.org. Credit Image: The National Institute of Anthropology and History (INAH). Researchers discovered last month that two large networks of underwater caves in Mexico’s Yucatan peninsula, the cave system known as Sac Actun, once measured at 263 km (163 miles), and in fact connected with the 83 km- (52 km-) Dos Ojos system forming the largest such structure on Earth. 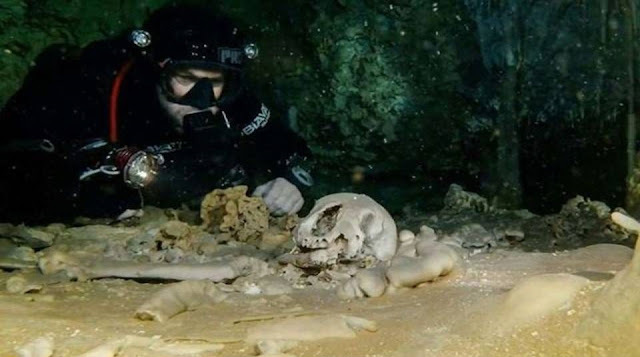 Diving with SCUBA gear, they have been exploring the ancient relics left in the caves over the millennia, in a project sponsored by Mexico’s National Institute of Anthropology and History (INAH). Researchers believe the water level in the caves has fluctuated over time, and that they were a source of water in times of severe drought, a sometimes perilous one. Some of the animals and humans who ventured inside never made it out alive. Today, their remains are a treasure trove for scientists, enabling them to piece together bits of the cave’s history dating all the way back to the Pleistocene epoch (2.6 million to 11,700 years ago). The animal remains include gomphotheres, an extinct elephant-like animal, as well as giant sloths and bears. Credit Images: The National Institute of Anthropology and History (INAH). Then there are the artifacts left inside by humans: burnt human bones, ceramics, wall etchings and more. Many others of the hundreds of sink-holes that connect to the cave have elaborate signs of ritual activity around them. 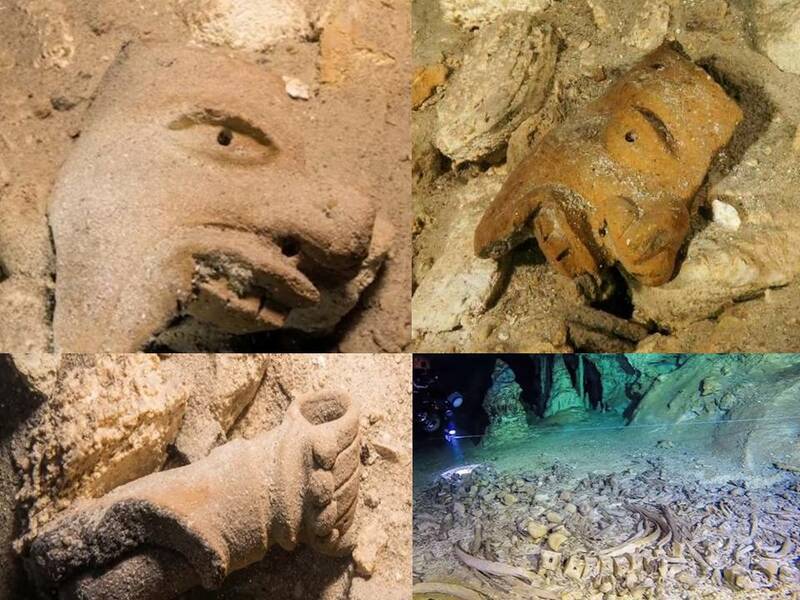 The ancient Mayans viewed caves, and especially ones that led to water, as extremely sacred places.